American Aldes, through its partnership with HTS Texas, has sold more than 600 Zone Register Terminals to be installed in the Gaylord Texan Resort and Convention Center’s new expansion, Vineyard Tower, scheduled to open in 2018. Vineyard Tower will add 303 guest rooms and 86,000 square feet of meeting space to the already-sprawling 1,511 guest room resort and convention center. 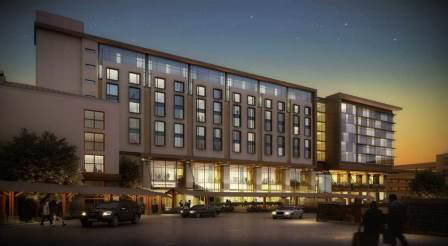 This will make it one of the top three largest non-gaming convention center hotels in the United States. Aldes Zone Register Terminals (ZRTs) provide on-demand boost airflow, typically used in bathrooms and laundry rooms to exhaust humidity and odors. When combined with an optional airflow regulator, they can also be used for continuous low-volume airflow to maintain healthy indoor air. ZRTs are frequently the preferred ventilation products for multi-unit buildings such as apartments, condominiums and hotels. In the guestrooms at Vineyard Towers, ZRTs will provide constant balanced and regulated exhaust and makeup air in each guestroom at the recommended rate at all times, and provide efficient demand ventilation when needed; ensure healthy indoor air quality for guests; control stack effect; and maximize energy efficiency in the process. Gaylord Hotels, a part of Marriott International, Inc., are well-known for their sprawling resort and convention centers and “everything in one place” concept. In addition to luxurious guest rooms, these properties include retail shops, spas, outdoor lounges, restaurants, fitness centers, pools, and a variety of meeting spaces, all in spectacular settings. Marriott International, Inc. is the world’s largest hotel company based in Bethesda, Maryland, USA, with nearly 6,000 properties in 120 countries and territories. Marriott operates and franchises hotels and licenses vacation ownership resorts. Gaylord Hotels are among the company’s 30 leading brands. Vineyard Tower is currently under construction and will open in late 2018.